Dominica, (pronounced /ˌdɒmɪˈniːkə/ (deprecatit template) DOM-i-NEE-kə French: Dominique) offeecially the Commonweel o Dominica, is an island naition in the Caribbean Sea. Tae the north-northwast lies Guadeloupe, tae the sootheast Martinique. Its size is 750 square kilometres (290 sq mi) an the heichest pynt in the kintra is Morne Diablotins, which haes an elevation o 1,447 metres (4,747 ft). The Commonweelt o Dominica haes an estimatit population o 72,500. The caipital is Roseau. Dominica haes been nicknamed the "Nature Isle o the Caribbean" for its seemingly unspoiled naitural beauty. 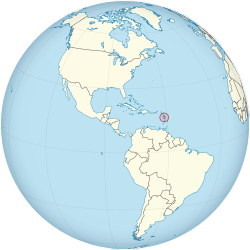 It is the yungest island in the Lesser Antilles, still bein formed bi geothermal-volcanic activity, as evidenced bi the warld's seicont-lairgest boilin lake. The island features lush muntainous rainforests, hame o mony rare plant, ainimal, an bird species. Thare are xeric auries in some o the wastren coastal regions, but hivy rainfall can be expectit inland. The Sisserou Parrot (an aa kent as the Imperial Amazon), the island's naitional bird, is featurt on the naitional banner. Dominica's economy is hivily dependent on baith tourism an agricultur. ↑ "Dominica Ethnic groups 2001 Census". Cia.gov. Retrieved 2013-09-29. ↑ 3.0 3.1 3.2 3.3 "Dominica". International Monetary Fund. Retrieved 2013-04-18. ↑ "English Pronunciation Guide to the Names of People, Places, and Stuff - How to pronounce Dominica". inogolo.com. Retrieved 2010-09-09. Wikimedia Commons haes media relatit tae Dominica. This page wis last eeditit on 10 Apryle 2018, at 00:47.